Over half of retail spend in Dublin City Centre comes from shoppers who arrived by public transport, a survey by Millward Brown for the National Transport Authority has found. A further 24% of the retail spends comes from people walking and cycling — which is higher than the spend by people arriving by car. 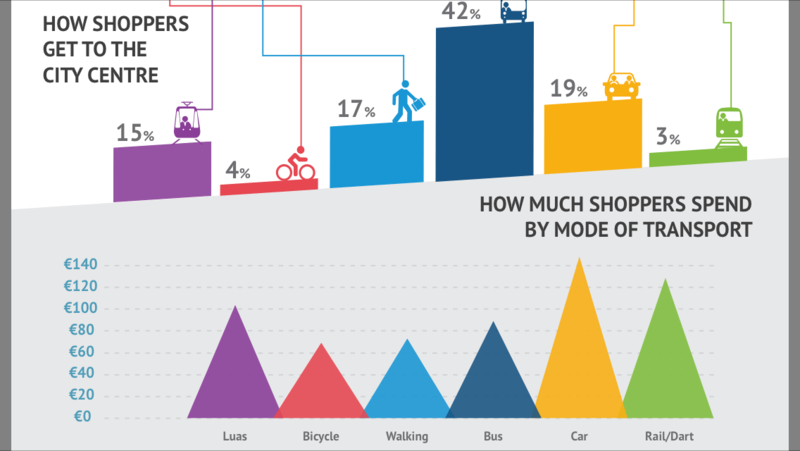 Over a fifth (21%) comes from people who walk into town and 16% comes from people taking the Luas in. Just under 20% comes from shoppers who arrive by car. Shoppers by bicycle in the survey accounted for just 3% of the spend overall — a previous survey showed a large difference between the two main shopping streets, however most details in this survey do not have a breakdown showing the differences in both streets. The Dublin City Centre Shopper Survey published today included a total of 1,671 respondents who answered questions on why they came into town, how they travelled in, how many times they had visited in the previous four weeks, and how much money they were spending in town that day. The on-street, face-to-face, survey was conducted by Millward Brown researchers, on Henry Street and Grafton Street in October 2104 amongst residents of the Republic of Ireland aged 16 and over. “We wanted to understand the spend, motivation and travel habits of people visiting Dublin’s city centre, and to measure the impact each transport mode makes on shopping activities in the city centre – to inform our future planning strategies for the Capital City,” said Anne Graham, CEO of the National Transport Authority. Full graphic of highlights here.